Teen Vogue HW #4 + how you can help! 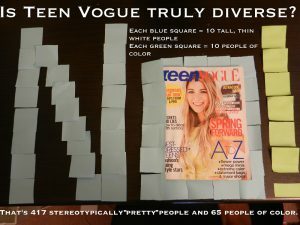 Print out our Teen Vogue action slips, filled with facts on how magazines like Teen Vogue affect teen girls. Cut them out. Customize them if you want, a little glitter never hurt anybody! Keep these slips with you, in your wallet or purse. Next time you’re in a place with a newsstand (Walmart, Target, the grocery store, or good old Barnes and Noble) creep into the magazine aisle. Find the little magazine with (chances are) a white girl with windblown hair on the cover. This is your target, Teen Vogue. Tuck a Teen Vogue action slip into the binding. Repeat as desired. But make sure you don’t damage any copies of Teen Vogue, that’s illegal and generally uncool. Make your escape and enjoy the rush that comes from feminist mischief making. Repeat! Print out copies for your friends. Go bookstore hopping. Give out an award to the person who infiltrates the most copies of Teen Vogue. Dedicate a Beyonce dance party to the winner. You can also tweet us your stealth images or your Teen Vogue analysis at @SPARKsummit, or post it on our Facebook page. Get at us–we can’t SPARK change alone! this is awesome I’ve recently started a report about Julia blum, i get more exited the more i read and watch, this great!!!! !